After several very serious posts about the history of the First Thanksgiving, I thought it made sense to share a few more humorous reflections. Since I’m relentlessly solemn myself, I have nothing to offer in this regard, so here are some links that colleagues and students have brought to my attention. * Rex Huppke, a columnist for the Chicago Tribune, exhorts us not to let Thanksgiving intrude upon our celebration of NovemChristmasber. * Finally, you might like this stop-animation short prepared by the folks at Intervarsity Press. Back with a few, more serious concluding thoughts tomorrow! Thanksgiving is now only five days away, so I thought I would return again for some reflections on the most popular Thanksgiving book of the season, Rush Limbaugh’s Rush Revere and the Brave Pilgrims. The book is holding at #3 in the Amazon best-sellers ranking, and even though it was only released at the end of October, it has already elicited nearly 600 reader reviews. You can read them here. The readers’ reviews are discouraging on multiple levels. Critics–and there aren’t many–have almost nothing substantive to say. Their comments consist almost entirely of ad hominem attacks on either the author or his supporters. Rather than seriously critiquing the book, they call attention to Limbaugh’s multiple divorces, his much-publicized addiction to prescription medications, or (most commonly) his king-sized ego and inflated sense of self-importance. In explaining the book’s popularity, they simply lash out at the “ditto-heads” stupid enough to waste their money on such drivel. What any of this has to do with Limbaugh’s understanding of the Pilgrims is far from clear. But the comments from fans of the book are almost as empty. The two most common observations are that 1) the book is entertaining, and 2) that it is historically accurate. I get the first judgment. Who among us prefers dense, dull, dry-as-dust prose? Making the past seem to “come alive” is always an asset, especially when you’re trying to reach younger readers. Furthermore, entertainment value is pretty much in the eye of the beholder, and if the reviewers on Amazon.com were entertained in reading the book, then they were. I might wish that they were training their children and grandchildren to appreciate better literature, but that’s a different matter. What I don’t get is the constant refrain of praise for the book’s historical accuracy. As I noticed in my last post, the book has no footnotes or bibliography, no reference to evidence of any kind. And yet the vast majority of readers have absolute confidence that Limbaugh is “setting the record straight.” It’s “about time someone tells our kids the truth about our history,” writes one reviewer. The book gives “an accurate account of American history!” exults another. It tells “the real facts,” is “truthful and honest,” and reveals “the REAL history of this amazing country,” echo others. And again I find myself asking, “how do they know?” Have they read the relevant early seventeenth century sources–e.g., Of Plymouth Plantation, Mourt’s Relation, Good Newes from New England, and The Works of John Robinson–and concluded that Limbaugh is true to the historical record? Or are they predisposed to accept on faith the “scholarship” of a radio personality whose politics they agree with? In truth, neither the book’s critics nor its defenders pay much attention at all to evidence. Critics seem to know in advance that they will hate the book and read it only to mock it. Advocates seem to know in advance that they will love the book and go on to adore it uncritically. There’s a lot of sound and fury here, but precious little substance. I began this blog more than a year ago out of a sense of calling to be in conversation with other Christians about what it means to think wisely–historically and Christianly–about the American past. If that is your desire as well, then I hope you will agree with me that loving God with our minds is worlds away from the mindless name-calling that so often masquerades as thoughtful reflection in today’s public square. Nor do we satisfy the biblical injunction to “take every thought captive into obedience to Christ” by simply determining the politics of the messenger and then reflexively embracing (or rejecting) the message. Ours is a higher, harder, and ultimately more rewarding calling. I didn’t write my recent book, The First Thanksgiving: What the Real Story Tells Us about Loving God and Learning from History, primarily to “set the record straight” about the Pilgrims and their 1621 celebration, although I did hope to provide a faithful retelling of that fascinating story. Rather, my primary goal was to warn readers about the snares that await us when we study history, and to introduce them to a variety of principles and concepts that are essential to keep in mind whenever we study any episode or people from the past. You know the old saw about the difference between giving someone a fish versus teaching them how to fish. I didn’t want to spoon-feed the “real story” of the past as much as show how the real story lays bare key principles for thinking historically and Christianly about the past. I wanted to help readers think historically more than tell them what to think about a particular historical moment. Rush Revere and the Brave Pilgrims illustrates pretty much every pitfall that I warn about in The First Thanksgiving, but in the interest of time I’ll just mention two. One of the most common temptations we face when studying history is the temptation to go to the past for ammunition instead of illumination–more determined to prove points than gain understanding. We fall into this trap whenever we know too definitely what we want to find in the past, when we can already envision how our findings can reinforce values that we already hold or promote agendas to which we are already committed. This approach to the past makes history just one more battleground in the culture wars, with both sides ransacking the past in search of evidence to support their own predetermined positions. When we employ the history-as-ammunition approach, we predictably find what we are looking for, but we rob history of its power in the process. History loses its power to surprise and unnerve us, ultimately to teach us anything at all. The second common temptation is to turn historical figures into our next-door neighbors in funny clothes–that is, thinking of them as just like us. If the temptation to search for ammunition reflects a propensity of our hearts, the tendency to exaggerate the familiarity of the past reflects a characteristic of our brains. We are wired to learn by analogy. Without even having to think about it, when we come across something new we reflexively search for an analogue, rummaging through the file drawers of our minds in search of the image or object or concept that most closely resembles it. When we find what looks like a decent match, we say that the new thing we have encountered is “like” something else. The construction of this analogy is totally natural, but it’s also dangerous, because once we have recognized something familiar in the past, we will be tempted to label it and move on rather than wrestle with it and learn. When we do that, we almost always exaggerate the degree to which the past was similar to the present. This danger is particularly great when studying groups like the Pilgrims who do share some of our ways of looking at the world. We read about men and women who were religiously motivated, family oriented, and committed to liberty–all of which is true–and without even realizing it we’re soon thinking of them as one of “us.” The problem with this is that, once it occurs, what really happens is that we stop thinking about them at all. They become our clones in funny clothes, and any chance of seeing ourselves more clearly or of learning from people who were the product of a different time and place goes right out of the window. Rush Revere and the Brave Pilgrims constantly exaggerates the similarity between the Pilgrims and 21st-century Americans. Oh, there are undoubtedly differences: the Pilgrims as Limbaugh describes them are more grateful than we are; they’re tougher, more courageous, more committed to liberty. But these are differences of degree, not of kind. The Pilgrims’ values are our values, they just lived them out more effectively. At bottom, they are who we want to be (or should want to be). They are us when we’re having a good day. A case in point is Limbaugh’s treatment of the Pilgrims’ commitment to liberty or freedom, a recurring theme throughout the book. We learn early on that the Pilgrims were “real people ready to give their lives for their freedom, no matter the cost, no matter the pain, no matter the sacrifice.” And indeed they were. But what the Pilgrims meant by “freedom” and what Rush Revere and the Brave Pilgrims conveys are two very different things. So what is the definition of “liberty” that is being conveyed? It boils down to freedom from external control. If a horse wants to go into a shoe shop, he should be able to, and no eleven-year-old school boy should be forced to do anything against his will. This definition nicely conforms with modern American values: our understanding of “rights” as “what I want” and of liberty as the individual freedom to do anything, say anything, go anywhere, etc. But it bears only the most superficial resemblance to what the Pilgrims had in mind when they spoke of liberty. From the Pilgrims’ perspective, human society was not a conglomeration of individuals but of groups. They believed that God had ordained three basic building blocks for society: the family, the church, and the civil community. Each of these constituent units was organic (like a living being), interdependent, and hierarchical. Each was characterized by shared responsibilities and mutual obligations within clearly defined chains of authority. So, for example, all of the colonists were to submit to the civil magistrate, whose authority (whether he was Christian or “heathen”), came from God. When the Separatists had decided to defy both the Church of England and the English king by creating their own congregations, they had not done so as an assertion of individual right, but as an expression of their obligation to obey God rather than man. The Pilgrims have no authority over us, and their way of looking at the world is not automatically binding on us. But their world view was not the one that Rush Limbaugh has given them, and readers of Rush Revere and the Brave Pilgrims should at least know that. What strikes me about these responses is how utterly confident the reviewers are in the historical accuracy of a work of children’s literature that centers on the adventures of a time-traveling talking horse. There are no footnotes. No bibliography. No list of suggested readings. No evidence of any kind. Historical evidence, for most of us, is sort of like the foundation of a house. I remember when my wife and I were ready to buy our first home. In the back of my mind, I knew that the structure needed to rest on a firm foundation, but I didn’t waste much time thinking about it. I was a lot more concerned about floor plans and color schemes and square footage, and I remember being irritated when someone suggested that I should look underneath our dream home before buying it. (“You want me to crawl where?”) I think we tend to shop for history in much the same way. If a particular history book reinforces convictions that we already hold, it rarely enters our mind to investigate the underlying evidence. No need to go down in the crawl space when the rest of the house is so appealing. When it comes to the use of evidence, Rush Revere and the Brave Pilgrims is simply a train wreck. I don’t say this gleefully, or with a sneer of condescension. Indeed, I say this as a political conservative who shares the author’s appreciation for the wisdom of our founders. I just wish he hadn’t botched the job so badly. The book may be entertaining–it may even inspire some young readers to want to learn more about their national heritage–but it fundamentally misrepresents the “Brave Pilgrims” it purports to honor. As Christian historian Beth Schweiger puts it so eloquently, “in history, the call to love one’s neighbor is extended to the dead.” The figures we study from the past were image bearers like us. They had their own way of looking at life–their own hopes, dreams, values, and aspirations–and when we ignore the complexity of their world to further neat-and-tidy answers in our own, we treat them as cardboard props rather than dealing with them seriously as human beings. Put simply, we are not loving them but using them. Rush Revere and the Brave Pilgrims does this in spades. I could offer numerous examples of what I have in mind, but for now I’ll just concentrate on one: Limbaugh’s characterization of the Pilgrim’s economic values. First, some background. Four centuries ago, the proposal to relocate a hundred people across an ocean to an uncharted continent was almost recklessly audacious. It was also prohibitively expensive, and most of the Leiden Separatists who were committed to the venture were also as poor as church mice. To succeed, it was imperative that they find financial backers who would bankroll the undertaking, and the company of London merchants who agreed to do so were no philanthropists. They were hard-headed businessmen who drove a hard bargain. And so, in exchange for the considerable cost of transporting the Pilgrims to North America and supplying them until they could provide for themselves, the Pilgrims agreed to work for the London financiers for seven years. During that time, under the terms of their agreement, everything they produced and everything they constructed (even including the houses they slept in) would belong to the company, not to them individually. At the end of the seven years, any revenue that had been generated in excess of their debts was to be divided among the London investors and the Pilgrim settlers. Next comes a crucial plot twist: According to governor William Bradford’s history Of Plymouth Plantation, in the spring of 1623 the surviving Pilgrim colonists began to debate among themselves whether there was anything they could do to improve the next year’s crop. The answer, after considerable debate, was to allocate to every household a small quantity of land (initially, one acre per person) to cultivate as their own during the coming season. Because the land varied considerably in quality, the plots were assigned by lot, with the understanding that there would be a drawing the next year and the next after that, etc., so that the land each family was assigned would change annually. This shift in economic organization looms large in how Limbaugh remembers the Pilgrims’ story, and he has been struck by it for at least two decades. I can say this with confidence because the talk show host also paid attention to the Pilgrims in his 1993 polemic See, I Told You So. In a chapter tellingly titled “Dead White Guys or What Your History Books Never Told You,” Limbaugh explained how “long before Karl Marx was even born” the Pilgrims had experimented with socialism and it hadn’t worked! “So what did Bradford’s community try next?” Limbaugh asks. “They unharnessed the power of good old free enterprise by invoking the undergirding capitalistic principle of private property.” And what was the result? “In no time the Pilgrims . . . had more food than they could eat themselves.” They began trading their surplus with the surrounding Indians, and “the profits allowed them to pay off their debts to the merchants in London.” In sum, the free market had triumphed. See, I Told You So never refers to the first Thanksgiving, but twenty years later, in Rush Revere and the Brave Pilgrims, Limbaugh claims that the Pilgrims’ celebration would never have occurred had they not abandoned their socialistic experiment. 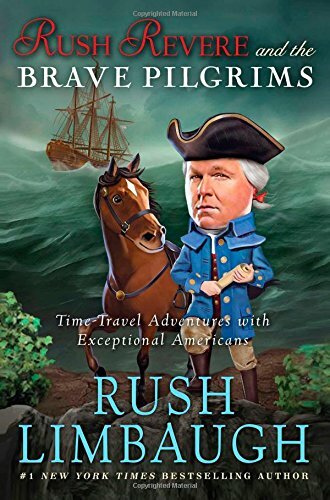 As a literary device, Limbaugh has Rush Revere and his talking horse, Liberty, time-travel repeatedly between the present and the winter of 1620-1621. (They are accompanied by two of Revere’s middle-school students–a trouble-making boy named Tommy and a Native American girl named Freedom.) In late December 1620, the time travelers pay a visit to the Pilgrims shortly after their arrival in New England and are surprised to learn that they plan on holding all property in common. “We are trying to create a fair and equal society,” William Bradford explains to them. “But is that freedom?” Rush Revere muses to himself. They return three months later, in March 1621, and are discouraged to see that the settlement is not prospering. William Bradford is perplexed; he had thought that centralized economic controls “should guarantee our prosperity and success. . . . But recently I’m beginning to doubt whether everyone will work their hardest on something that is not their own.” At this point, young Tommy relates to Bradford how hard his mother works to win prizes at the county fair, prompting the Pilgrim governor to speculate whether giving each family their own plot of land might motivate the Pilgrims to work harder and be more creative. In an epiphany, Bradford realizes that “a little competition could be healthy!” “Brilliant!” Rush Revere responds. The rest, as they say, is history. There is just one problem: it’s not true. Oh, the Pilgrims undoubtedly moved toward the private ownership of property, but they did so in 1624, according to William Bradford, three crop years AFTER their autumn celebration in 1621. To make the movement toward private property the necessary precondition for the First Thanksgiving is, historically speaking, a real whopper. To use a pejorative label that the radio personality is fond of wielding, this is revisionist history with a vengeance! But there is more amiss here than a chronological gaffe. When the Pilgrims did move toward the private ownership of property, the shift was not quite the unbridled endorsement of free market competition that Limbaugh would have us believe. Nearly two centuries ago, the brilliant conservative Alexis de Tocqueville observed that “a false but clear and precise idea always has more power in the world than one which is true but complex.” Limbaugh’s characterization of the Pilgrims’ economic shift is clear, precise . . . and false. The reality is complex. On a visit to Plymouth at the very end of 1621, deacon Robert Cushman (a church official in the Leiden congregation) was invited to preach to the Pilgrims and chose for his text I Corinthians 10:24: “Let no man seek his own: but every man another’s wealth.” The decision to allow each household to work its own individual plot represented a movement away from this ideal–but only partially. Both Bradford and his assistant Edward Winslow described the shift not as a good thing, in and of itself, but as a concession to human weakness. It was an acknowledgment, in Winslow’s words, of “that self-love wherewith every man, in a measure more or less, loveth and preferreth his own good before his neighbor’s.” Because “all men have this corruption in them,” as Bradford put it, it was prudent to take this aspect of human nature into account. This was still a century and a half, however, before Adam Smith’s Wealth of Nations would celebrate the enlightened pursuit of self-interest as the surest way to promote the general welfare. In countless ways, the Pilgrims showed that they still belonged to an earlier age. In economics, as in all of life, they viewed liberty as the freedom to do unto others only as they would be done by. The golden rule meant that there were numerous instances in which producers must deny themselves rather than seek to maximize profit, and if they were unwilling to police their behavior voluntarily, the colony’s legislature was willing to coerce them. Nor was it acceptable to gouge their neighbors by selling products or services for more than they were intrinsically worth. The colonial government passed laws regulating the price that millers charged, the fares ferrymen imposed, the wage rate of daily laborers, and the ever-important price of beer. Pilgrim Stephen Hopkins ran afoul of the latter, and was called before a grand jury for selling one-penny beer at twice the going rate. A few years later, a colonist named John Barnes was charged with buying grain at four shillings a bushel which he then sold at five, “without adventure or long forbearance.” He had not assumed a significant risk in the transaction, in other words, nor held the grain for a considerable period of time, and under the circumstances he had no right to a 25 percent profit, even if a buyer was willing to meet his price. In sum, there was nothing intrinsically moral about what the market would bear. And what of Limbaugh’s claim that the Pilgrims’ shift toward free enterprise would enable them “soon” to repay the company that had sponsored them? This assertion, at least, is correct, if by “soon” Limbaugh meant twenty-eight years, which, according to William Bradford is how long it took the Pilgrims to erase their debts. In truth, the assertion is misleading in the extreme. So where does this leave us? Before anyone concludes that I am a closet communist, I will say again that I am politically conservative. What is more, the fact that Limbaugh is badly in error about the Pilgrims does not, in itself, discredit his economic views. We don’t automatically have to follow the Pilgrims’ lead in this or any other area of life; God has granted them no authority over us. They didn’t celebrate Christmas, wear jewelry, or believe in church weddings, and I have no qualms whatsoever in choosing not to follow their example in such matters. But I do feel compelled to call Limbaugh to account for such an egregious misrepresentation. As a historian, I think no good cause is ever served by distorting the past, whether intentionally or accidentally. And as a Christian historian, I am grieved that the Pilgrims’ timeless example of perseverance and heavenly hope amidst unspeakable hardship has been obscured, their faith in God overshadowed by their purported faith in the free market. Humility is a virtue, but I struggle with pride. Pride besets me in any number of ways, but one of the most powerful is through my job. It is so easy to base my sense of self-worth and identity on what I do for a living. (Can any of you relate?) That is why, for me at least, it is so healthy to be reminded from time to time of the less than exalted opinion the broader culture has of history and historians. Until quite recently, whenever I needed a dose of humility I thought back to an episode early in my teaching career. The year was 1991, and a retired humanities professor from the University of Florida had raised eyebrows by announcing her suspicion that Zachary Taylor, not Abraham Lincoln, had been the first American president to be assassinated. Taylor had died in July 1850, sixteen months into his presidency, supposedly of acute gastroenteritis brought on by eating massive quantities of raw cherries and iced milk during a Fourth of July celebration near the foot of the as yet unfinished Washington monument. Not so, said Professor Clara Rising, who speculated that the twelfth president had actually been poisoned by one of his political enemies. Although she had no real evidence to support her suspicions, Rising convinced Taylor’s descendents to agree to an exhumation of their ancestor’s remains, and for a week or so that June the nation breathlessly awaited the results of the partial autopsy. This was my opportunity for lasting fame, or so I thought. Even though I was only finishing my third year as a history prof at the University of Washington, I had already figured out that the broader culture didn’t typically view my knowledge and expertise as relevant to anything of contemporary importance. I could count on the fingers of one hand the number of times that individuals from outside the university had contacted me in order to benefit from my vast storehouse of knowledge. There was the reporter during the first Persian Gulf War who wanted to know why yellow ribbons had come to symbolize remembrance of loved ones in the military. There was the Boeing employee with too much time on his hands who wanted me to help settle an office bet about the origins of the term “ten gallon hat.” There was the anonymous e-mail from the history buff who wanted to know why so many Civil War battles took place near national parks. That’s about it. Now everything had changed. Within hours of the announcement of the impending autopsy, a TV journalist from a popular Seattle news magazine program was calling to say that he would like to interview me to get my take on the story. He wanted me to speak about the implications of Taylor’s alleged assassination, how it changed the course of history, etc. I cleaned up my office (no small feat), put on a tie, and in a lengthy interview I shared a plethora of erudite insights about Zachary Taylor, antebellum American politics, and the coming of the Civil War. I was soon to be a celebrity. And then the results of the autopsy were announced the next morning, and unfortunately (at least for my television career), there was no evidence of foul play. I never talked to the producer again. All I got was a telephone message left while I was in class. One of the secretaries in the History Department office had summarized the message on one of those pink”while you were out” slips that functioned as voice mail before there was voice mail. “Taylor wasn’t poisoned, so no story,” said the memo. “Thanks anyway.” I was crushed. That night I tuned in to the news magazine program nonetheless, eager to see what would be aired in place of my interview. “What could possibly be more important,” I asked myself, “than the nuggets of wisdom I shared about the coming of the Civil War?” The answer came shortly. The entire thirty-minute program centered on a group of middle-aged businessmen in western Washington who went out into the woods and walked barefoot over hot coals in order to increase their self-confidence. I’ve never forgotten that. As I said, I struggle with pride. I find it helpful to be reminded exactly where I, a professional historian, stand in society’s scale of values. The answer: not very high up. This episode has served as an effective reality check for more than two decades, but I think I’ve just hit upon a new one that will work even better. As readers of this blog will know, I am the recent author of a book titled The First Thanksgiving: What the Real Story Tells Us about Loving God and Learning from History. For more than six years I worked on the book, reading every scrap of evidence I could locate, both about the First Thanksgiving itself as well as about how Americans have remembered that event over the past four centuries. A real labor of love, the project reflected my own evolving sense of calling and the burden that I felt to be in conversation with Christians outside the Academy on the question of what it means to think Christianly about our national heritage. I was delighted when Intervarsity Press agreed to publish it, and pleased that they scheduled its release for the end of summer–just in time for Thanksgiving. I hope to offer an extended review of the book in a couple of days, but here is the basic premise: The book is told from the vantage point of a substitute middle school history teacher named Rusty Revere. Rusty (who goes by the nickname Rush) loves American History. And he knows a great deal about it, too, not only because he likes to read about it, but because he has actually experienced it directly. You see, Rush Revere is blessed to own a horse named Liberty who, as it happens, can both talk and travel through time. Whenever Liberty breaks into a gallop and exclaims “rush, rush, rushing to history,” a time portal opens and he and Rush can return to any moment in the American past that they choose. In Rush Revere and the Brave Pilgrims, Rush and his talking horse return to the early 17th century and “set the record straight” about the Pilgrims and the First Thanksgiving. Not released until October 29th, the book has already been reviewed by 371 readers on Amazon, 95% of whom give the book 4 or 5 stars (out of 5). The most common theme in their rave reviews is the convictions that the account is “actually historically true,” is “an ACCURATE re-telling of early American history,” and “explains the real history of America.” Hmmm. I find myself wondering how they know this. . . .
And why, you ask, does this popular story of Rush Revere and Liberty the talking horse help to keep me humble? I struggle with pride, remember, and this means that I have found it impossible to resist checking the ranking of The First Thanksgiving on Amazon.com. These rankings change constantly, but as I write this, the book comes in at #23,567. And Rush Revere and the Brave Pilgrims? After an early media blitz it has tailed off badly. Indeed, it is now only the third most popular book that Amazon sells. Back with a review soon. By all appearances, Americans still cling to the Thanksgiving holiday, setting aside a few hours for a special meal with family and friends before turning on the football game or heading to the mall for a deal on electronics. But we have long since abandoned any idea of a Thanksgiving season, an extended period in which to anticipate the holiday, reflect on its significance, and live out its meaning. In my neighborhood at least, the Christmas decorations went up in the stores as soon as the Halloween decorations came down. On television, the moment the calendar turned to November the Hallmark Channel began its “Countdown to Christmas” movie marathon. Less sentimental, Amazon.com immediately began trumpeting the “Countdown to Black Friday.” Who has time for Thanksgiving any more? This is sad for any number of reasons, not the least of which is that, if we only have ears to hear, the Pilgrims might have much to say to us that we need to take to heart. To begin with, meditating on the Pilgrims’ story might show us our worldliness. “Do not love the world or the things in the world,” John the apostle warned, referring to the hollow rewards held out to us by a moral order at enmity with God (I John 2:15). From our privileged perspective the Pilgrims lived in abject poverty, and imagining ourselves in their circumstances may help us to see more clearly, not only the sheer magnitude of pleasure and possessions that we take for granted, but also the power that they hold over our lives. 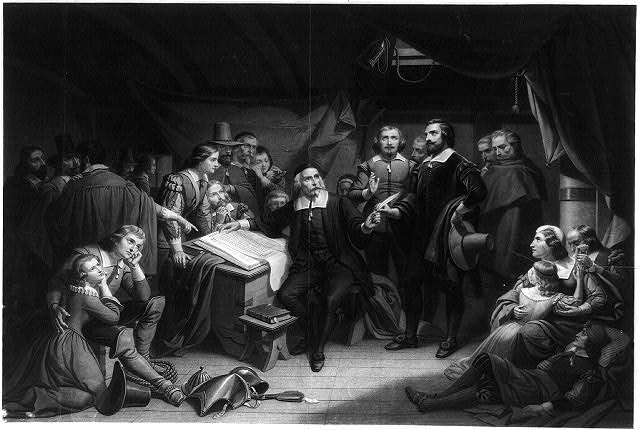 Years afterward, Plymouth governor William Bradford would recall the “great labor and hard fare” that defined the Pilgrims’ material circumstances while in Holland. Their homes were ridiculously small by our standards, some with no more than a couple hundred square feet of living space. Half or more of the congregation had become textile workers. In contrast to the seasonal rhythm of life they had known in England, they now earned their bread by carding, spinning, or weaving in their tiny homes from dawn to dusk, six days a week, merely to keep body and soul together. Although they looked forward to greater prosperity in New England, upon their arrival in the autumn of 1620 they had immediately encountered almost unimaginable hardships, and by the following spring fully one half of their original number was dead. When they celebrated God’s provision of an adequate harvest that fall, the survivors consisted largely of widowers and orphans. (Fourteen of the eighteen wives among the original party had perished.) That the Pilgrims could celebrate at all in such circumstances should humble us. What what was the source of such resilience and gratitude? The answer, I believe, lies in the Pilgrims’ theology, the heart of which lies hidden in plain sight. We have referred to the passengers of the Mayflower as “Pilgrims” for so long that the term has lost all significance to us. Literally, the word “pilgrims” refers to a person on a journey, often, but not always, to a place of religious significance. When the Pilgrims thought of themselves as “pilgrims,” they meant that they were temporary travelers in a world that was not their home. May that be said of us as well. * On the danger of thinking of the Pilgrims as being just like us, click here. * Click here for my brief take on the concept of “Christian” history. * On the danger of imputing authority to historical figures, click here. 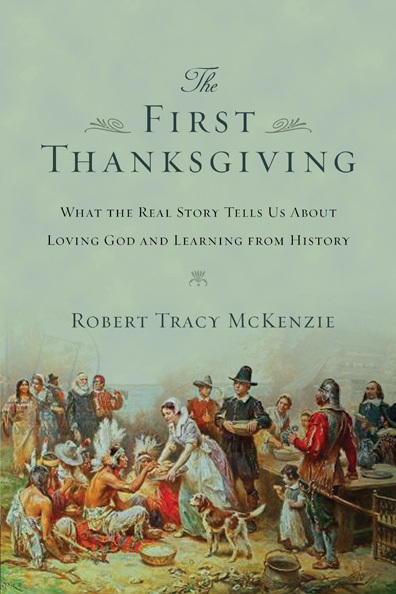 Intervarsity Press is the publisher of my recent book The First Thanksgiving: What the Real Story Tells Us about Loving God and Learning from History. The staff there have been a delight to work with from beginning to end.